"Get married already!" Arjun Kapoor and Parineeti Chopra were told after photos of the duo from a recent photoshoot for a magazine went viral. Both Arjun and Parineeti shared photos from the bridal magazine's photoshoot, following which comments like "Please marry her for real", "Best Jodi", "couple goals", "get married you two" and many, many more rooting for Arjun and Parineeti to translate their onscreen rapport into real-life romance. However, Arjun, who spotted a compilation of the comments on Instagram, tweeted to say he's in no hurry and that Parineeti can wait. Well, Arjun, Parineeti also "doesn't have dates" either or at least that's what she said on Twitter. 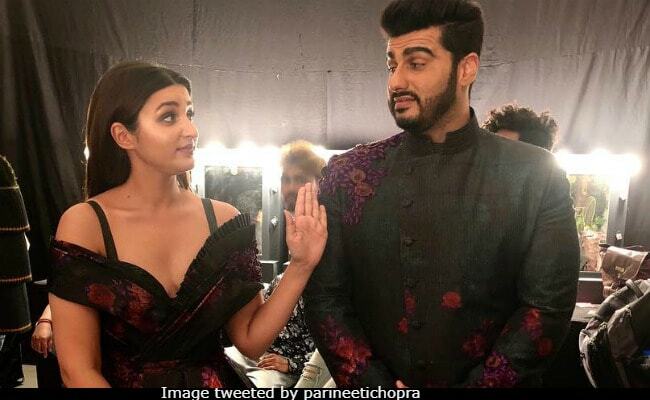 "This chokra is jawaan and in no hurry to get married...Parineeti Chopra please wait while I age gracefully and consider my options," was Arjun Kapoor's response to fans, with which he also trolled his favourite frenemy Parineeti. Meanwhile, this is what she had to say: "Oh nooo! Sheeeeee! Arjun Kapoor, please excuse me I don't have dates... please contact my manager." Parineeti and Arjun had also introduced the magazine cover with hilarious captions on Instagram. Apparently, it was a fan-moment of sorts for Arjun to have featured with Parineeti: "Absolutely thrilled for Arjun Kapoor , who gets a chance to share a magazine cover with me! Hi baba how does it feel to achieve this milestone? #ParineetiPosesWithAFan #CareerHigh," she wrote. LOL. Arjun is no less, who added one of his own: "What an amazing moment for Parineeti Chopra! Congratulations on this amazing opportunity of sharing the cover with me! These newcomers I tell you... you say hi and they come sit on your lap! Bachpan se godh mein utha ke chal Raha hoon tumhe... lucky girl!" On a serious note, in an interview with Hindustan Times recently, Arjun said his turn will come only after sisters Rhea and Anshula Kapoor are married: "I'll get married when Rhea and Anshula do. It could take two, four or even six years, I don't know." Arjun Kapoor and Parineeti Chopra are on a promotional roll for their next film Namaste England. They also have Sandeep Aur Pinky Faraar together. Parineeti has Jabariya Jodi with Sidharth Malhotra in the line-up while Arjun will also be seen in India's Most Wanted.